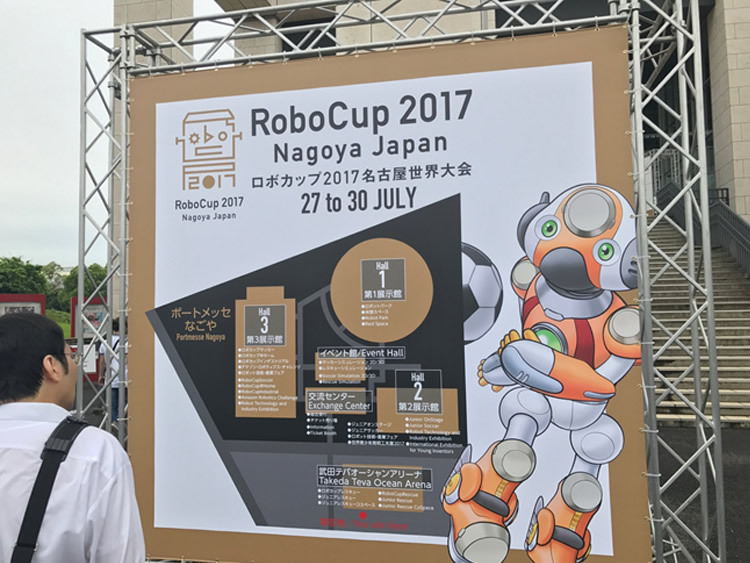 The first RoboCup was held in Nagoya in 1997 with the ambitious goal of “fielding a team of robots capable of winning a game against the human soccer World Cup champions by 2050.” Now, 20 years later, a remarkably-scaled up event took place again in Nagoya this year. This year’s event drew approximately 3,000 researchers and students as participants from 42 countries and regions around the world, as well as approximately 130,000 visitors. It was held at Portmesse Nagoya (Nagoya International Exhibition Hall) and Takeda Teva Ocean Arena. These spacious venues and the surrounding areas were staffed with many volunteers in pink bibs, who served as guides to prevent visitors from losing their way and help them with any problems. 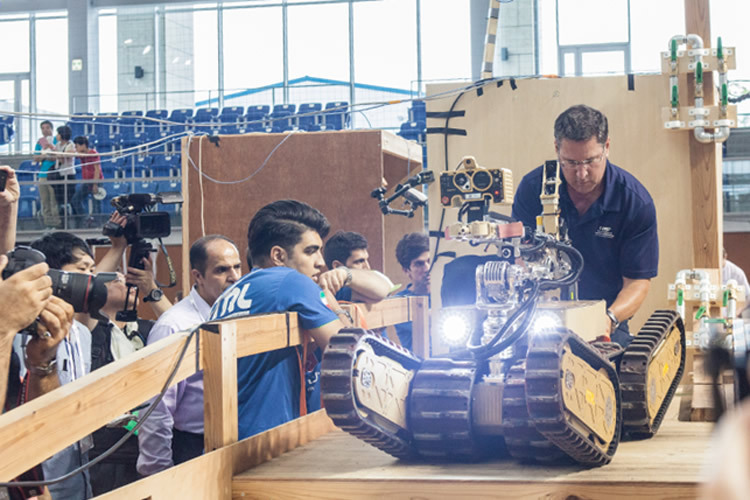 Although RoboCup is a competition, the ultimate focus is not on “winning.” The event serves as an opportunity for participants to generate new innovations or ideas that might lead to innovation toward the next generation by researching and developing robot technology, and to demonstrate technology for contributing to society in the form of a competition. This philosophy is instilled in each participant’s mind. 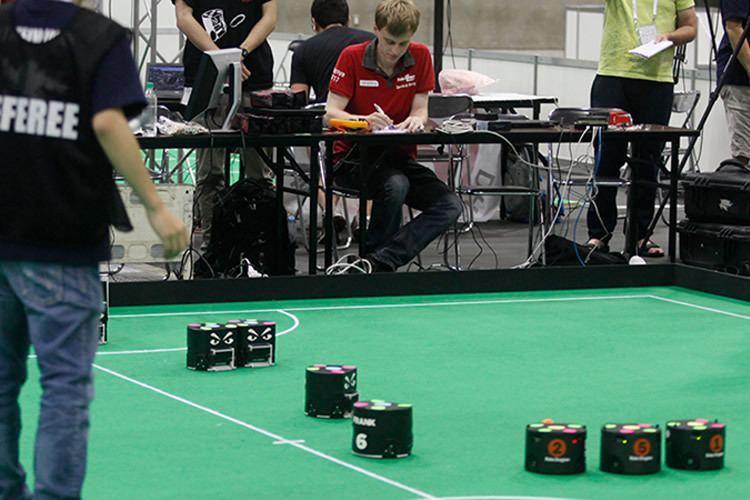 RoboCup includes not only soccer games but also some other competitions. 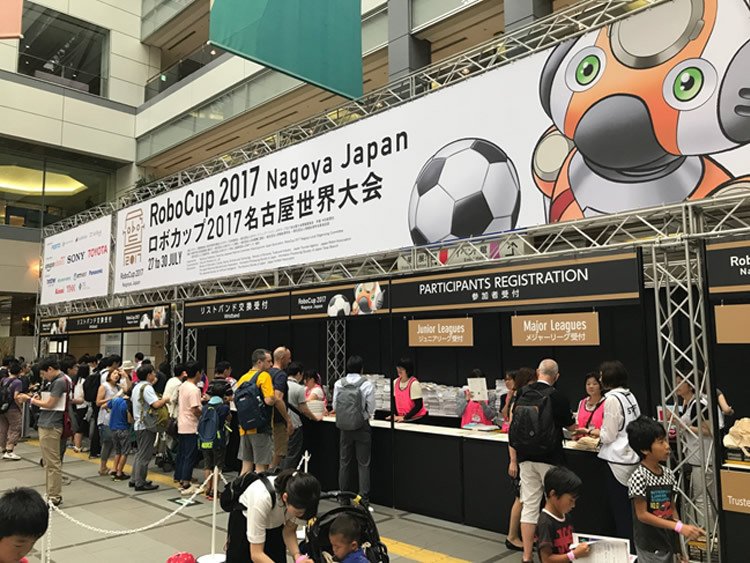 As you might expect, however, the event’s representative feature is RoboCup Soccer, which is divided into the humanoid category (Humanoid League/Standard Platform League) and the wheeled category (Middle Size League/Small Size League, etc.). 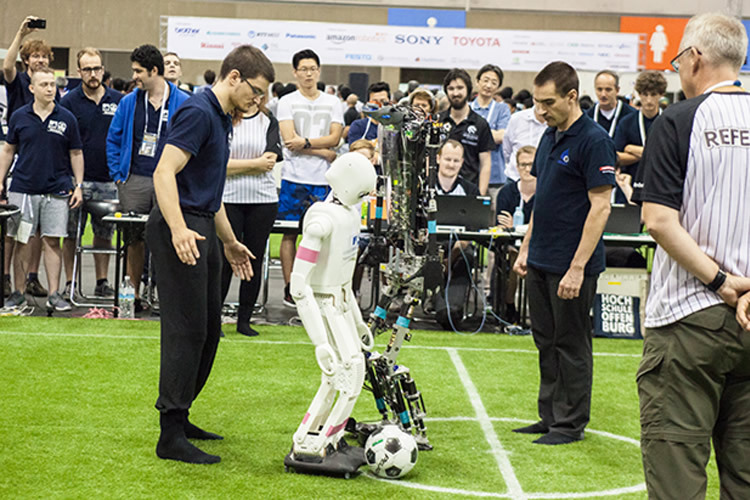 In the Middle Size League and the Small Size League, special robots with wheels are used, and the focus is on playing soccer at a high level. 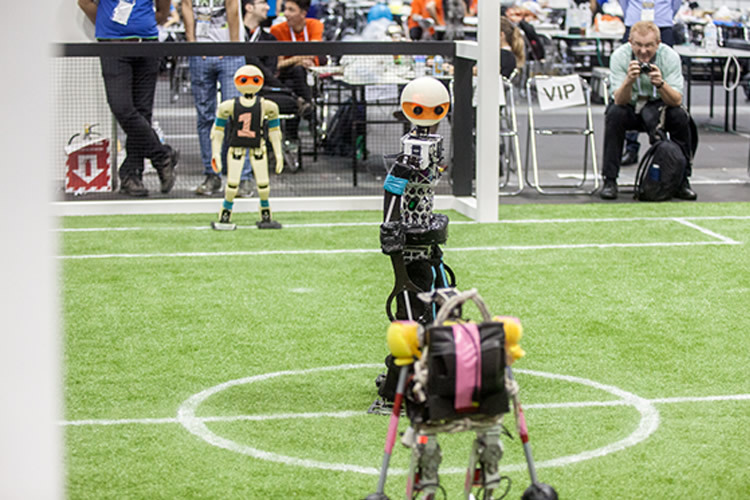 In these leagues, spectators enjoyed watching speedy and well-coordinated play by robots. On the day of the final round, the venue was filled with many spectators, who cheered the teams on enthusiastically. The winner of the Middle Size League was the team Water, while that of the Small Size League was the team SRC. Although a number of Japanese teams participated, they unfortunately could not make it through to the final rounds. 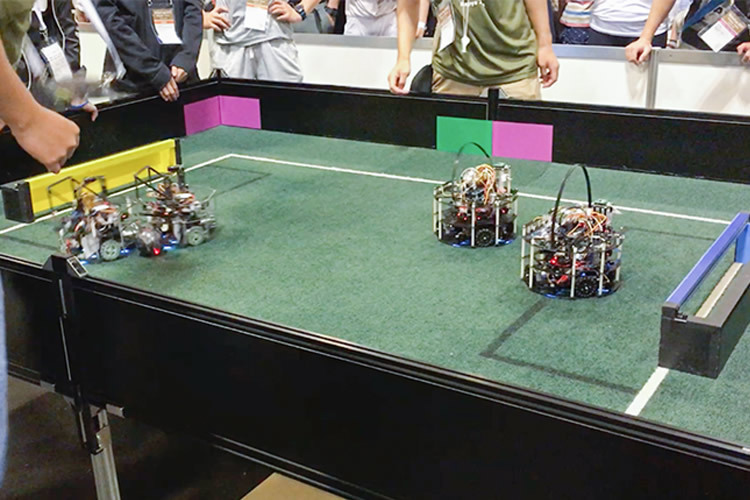 In the Middle Size League, a 10-minute exhibition match was held between the winning team Water’s autonomous robots and humans. Such an event has been held every time in recent years. The game was won by the humans by a score of 3-1. 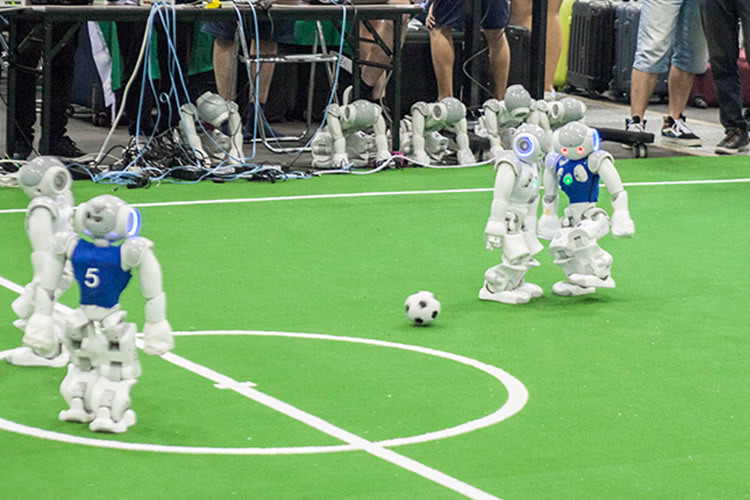 Although this indicates that humans can play soccer much better than robots, the fact that the robots scored a goal suggests that it will not be long before robots will beat humans at soccer. Due to the limits of current technology, the best thing that robots can do today is simply to walk. 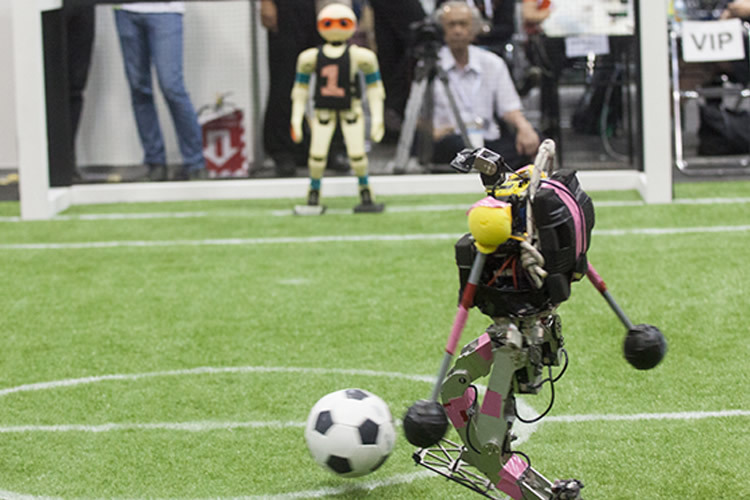 Accordingly, when robots kick a ball, they frequently lose their balance and fall over. 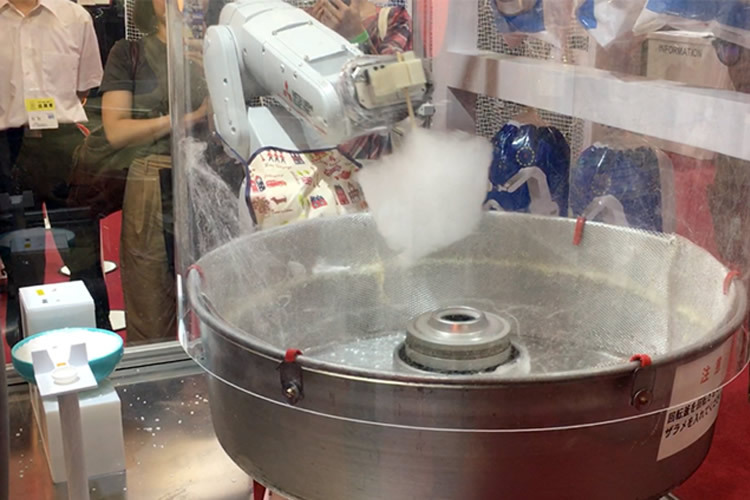 In addition, it takes more than a few seconds for robots to simply find the ball during their game, and some robots mistake a spectator’s bag as the ball and begin to walk toward the spectator’s seat. 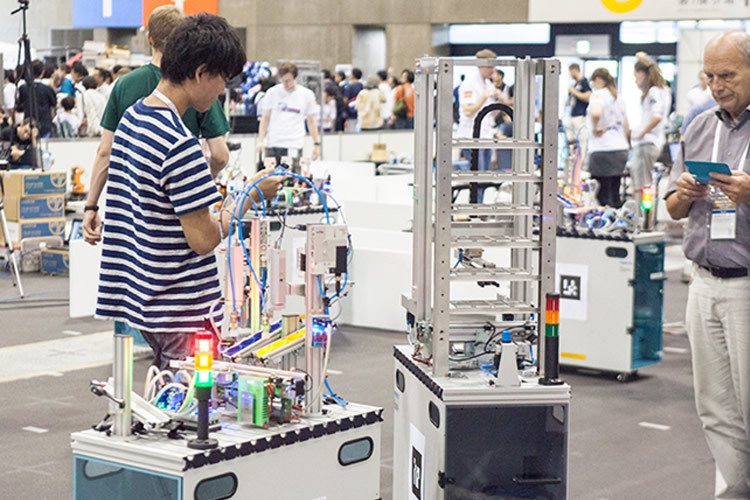 However, robots are continuing to improve year by year, even though the pace is rather slow, and the organizer of RoboCup is also continuing to raise game hurdles. For example, although the game balls used to be painted orange so that robots could recognize them easily, they were replaced a few years ago with official balls used at human soccer games. Moreover, although carpets used to be laid on game fields so that robots could move smoothly, they were also replaced with artificial turf. 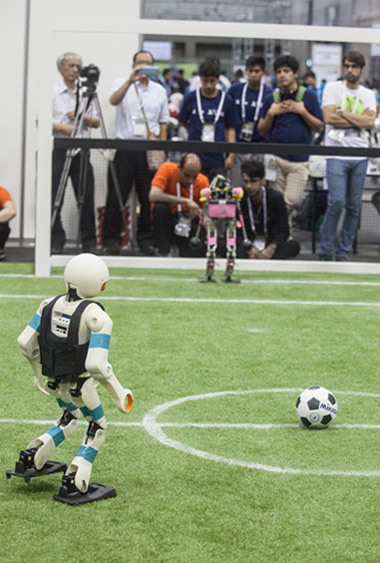 Although the present technology is not yet developed fully enough to enable robots to walk on artificial turf, the replacement was conducted to eventually accomplish the ultimate goal of beating a human soccer team in the future. To move toward achieving this goal, the difficulty level of the games is steadily raised. The Humanoid League, where biped robots play games, consists of the three sub-leagues categorized according to robot size: AdultSize (130 cm – 180 cm); TeenSize (80 cm – 140 cm); and KidSize (40 cm – 90 cm). In actual games, robots do not move as probably expected by spectators at first. They find the ball, approach it, and fall down, or bump into an opponent and fall down. Some might expect that they would feel frustrated while watching such a game. However, the atmosphere of the venue is free from such feelings. 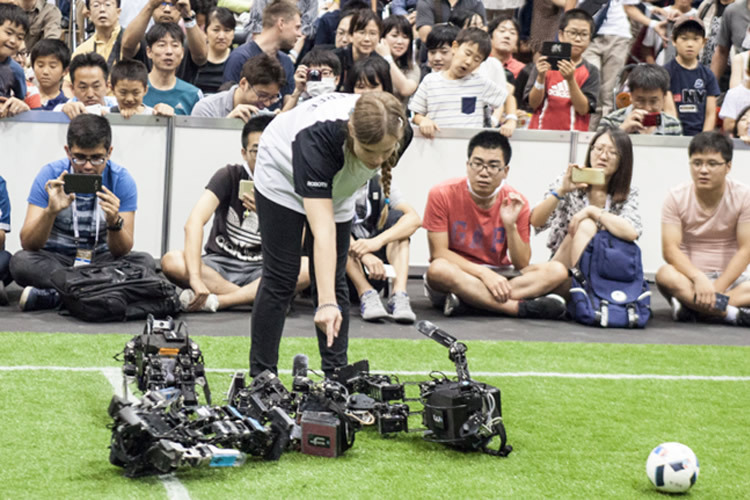 In this year’s games, robots fell down while simply walking or went back and forth attempting to find the ball, making children among the spectators burst into laughter and bringing ridicule from adult spectators. 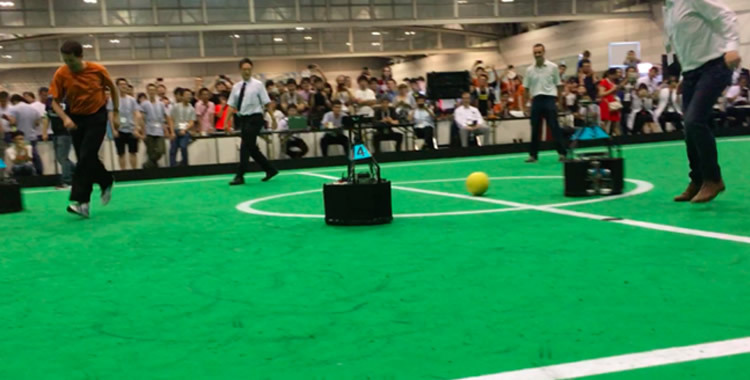 Once one of the robots kicked the ball while falling down and the ball slowly went into the goal, however, a great cry of joy came up from the spectators, with the cry echoing throughout the venue hall. The winner of the KidSize was the team Rhoban Football Club, while the winner of the TeenSize was the team NimbRo, which also won in the AdultSize. 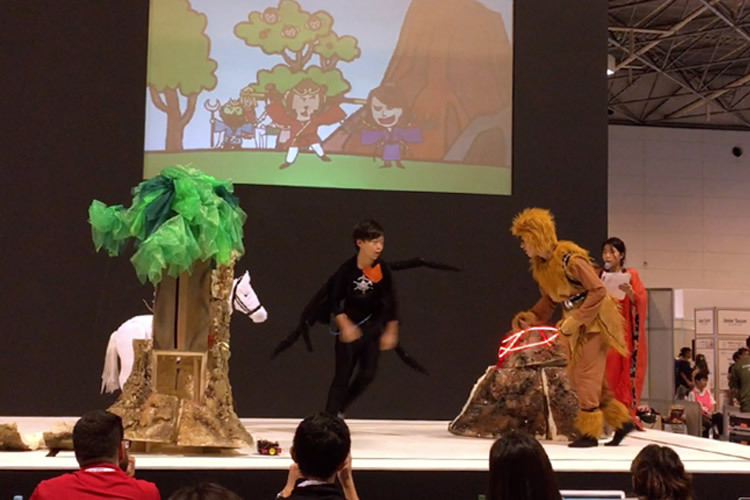 As a representative of Japan, the team CIT Brains, Chiba Institute of Technology, finished in third place in the KidSize, and in first place in the Kid-Size Technical Challenge. One of the technologies newly introduced by some participants this year is deep learning, an AI-related machine learning technology. The introduction of deep learning can lead to a dramatic increase in the accuracy of the visual recognition by cameras. The team CIT Brains used robots equipped with NVIDIA’s small AI computer board. 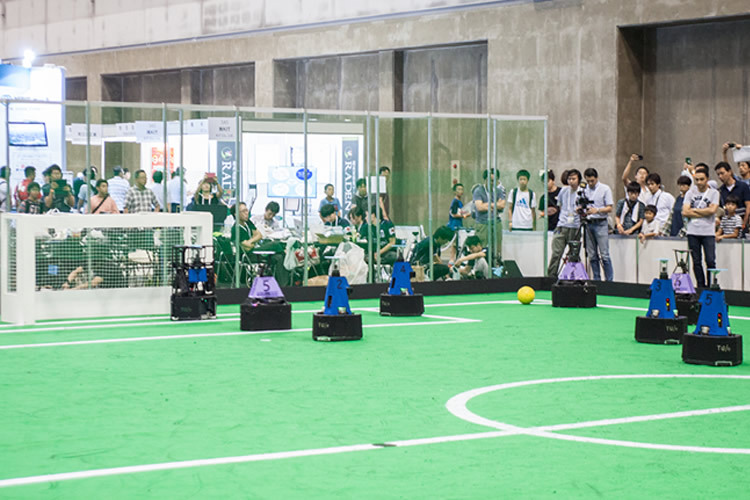 Featuring SoftBank Robotics’ NAO, the Standard Platform League, a type of humanoid-robot soccer league, was also popular enough to attract many spectators who rooted for the robots. Although no Japanese teams could finish in first place or other high places in the soccer game category, the team Camellia Dragons from Aichi Prefectural University finished in first place in the Challenge Shield of the Standard Platform League, in which only specially qualified teams could participate. In the Soccer Simulation League as well, heated games were played on a virtual field on computer. In the 2D Simulation League, the joint team HELIOS2017 from Fukuoka University and Osaka Prefecture University finished in first place. In the Soccer 3D Simulation League, the team FUT-K from the Fukui University of Technology finished in third place. Designed for those aged 19 or under, RoboCupJunior consists of Soccer, Rescue, and On-Stage competitions. 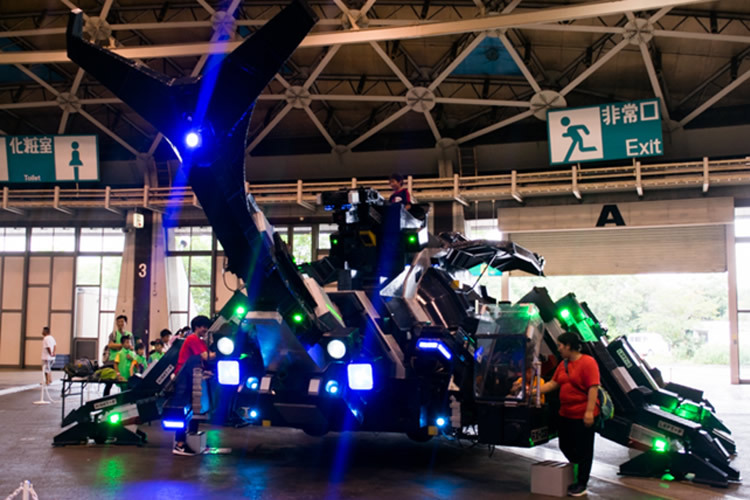 During games, participants showed their strong passion for robots, raising expectations that there were future leaders of the robot industry among these participants. Meanwhile, On-Stage serves as an opportunity for participants to demonstrate their freely- conceived ideas, and seems to contribute to the development of so-called “STEAM” (“STEM” plus art) education. 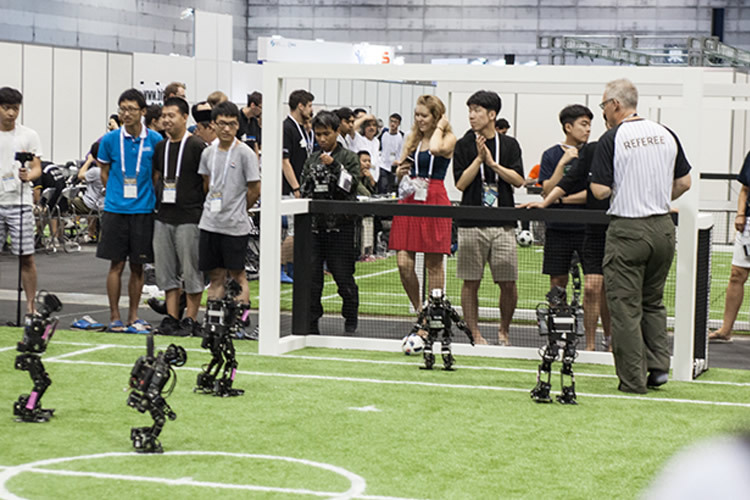 The soccer games were not the only events to attract a lot of attention, RoboCup@Home was also popular. 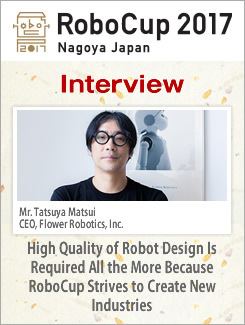 This league featured robots supporting people’s daily lives, such as Human Support Robot (HSR) by Toyota Motor and Pepper by SoftBank Robotics. In the Domestic Standard Platform, where HSR was used, the team Hibikino-Musashi@Home SPL from Kyushu Institute of Technology finished in first place, followed by eR@sers from Tamagawa University. Japanese teams, therefore, achieved the remarkable feat of taking both first and second places. The Rescue League features a field with rough tracks and other characteristics prepared based on a disaster scenario. Semi-autonomous or controlled robots move across such a field, take photographs of the inside of structures, and find those who need rescue. Some of the technologies that helped teams to finish in high places in the Rescue League are actually used to explore the inside of the Fukushima Daiichi Nuclear Power Plant, making the league even more significant for Japan. The winner of the league was the team from Iran, YRA Islamic Azad University of Yazd. The team Shinobi from Kyoto University, Japan, proceeded to the final round, but it was unfortunately defeated. However, the Japanese team won the award Best in Class Dexterity. In RoboCupIndustrial, the concept of Industry 4.0, which is led by the German government and touted as the fourth industrial revolution, has been reflected. A multiple number of mobile robots work in coordination to make designated items by autonomously moving around many component- feeding, manufacturing, and processing machines, until finally delivering finished items to a distribution center. In this league, teams from German-speaking countries showed overwhelming strength. 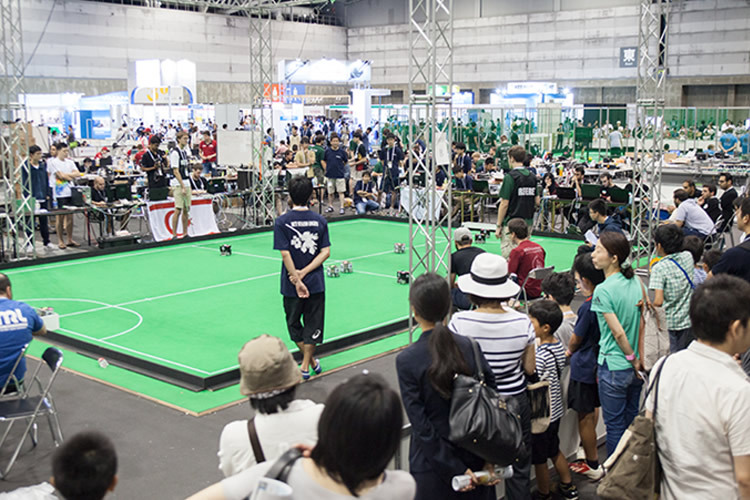 Partly because RoboCup was held during the summer vacation, the event attracted many family groups. 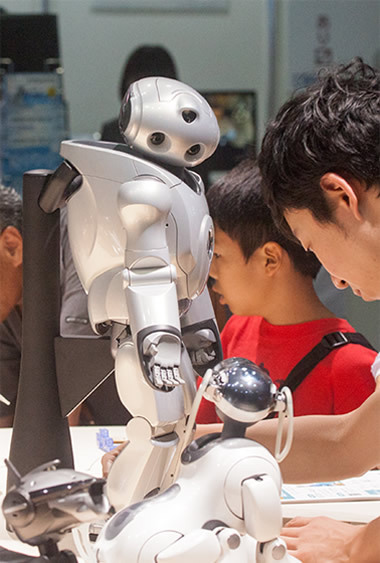 Some of the exhibition booths set up by sponsors and other organizations contained the pet robot by SONY, AIBO, and the biped robot QRIO. 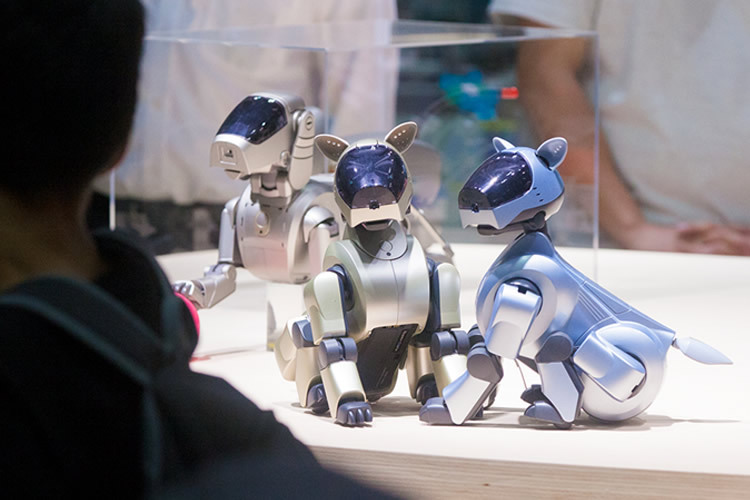 Although the manufacture and sale of AIBO has already been ended, it was still used as a competition robot at RoboCup. 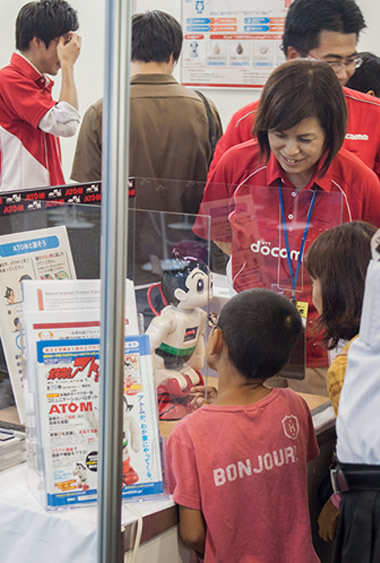 In addition, Toyota exhibited HSR, while NTT Docomo exhibited Mighty Atom, greatly pleasing children. 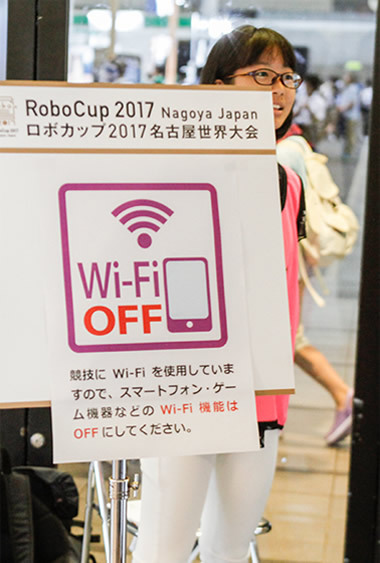 The next RoboCup will be held in Montreal, Canada. Against the background of a global increase in interest in robots and artificial intelligence, the passion for technology innovation and advances will be handed down to the next generation.